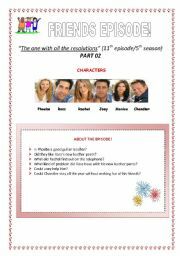 PART 01 - Video Session - Friends Episode: "The one with all the resolutions"
PART 02 - Video Session - Friends Episode: "The one with all the resolutions"
Video Session - Friends Episode: "The one with the list"
This worksheet is about a GREAT episode of Friends called "The one of the list" (the 8th of the 2nd season). It´s really funny and romantic and it really involves us. 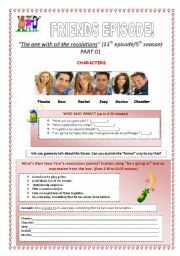 After watching it, students answer some comprehension questions and some True or False questions too. I hope you and your class like it! Hi everyone! 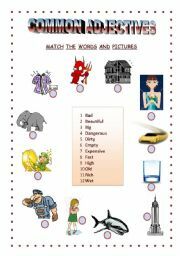 This is a cute worksheet about common adjectives in which students have to match the words and pictures! Enjoy it! Hi everyone! 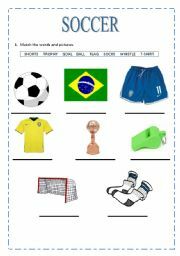 This is an worksheet to teach extra vocabulary about SOCCER! I hope you and your students enjoy it. Hey everyone! 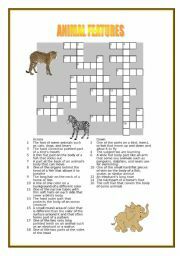 This is a crossword about "Animal Features". It includes words such as: mane, hoof, wing, beak, tail, tusk, fur, paw and others. 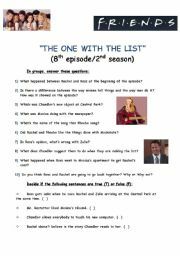 (ANSWER KEY INCLUDED!)Ps. : the definitions used are from Macmillan´s Dictionary. Have a nice day!